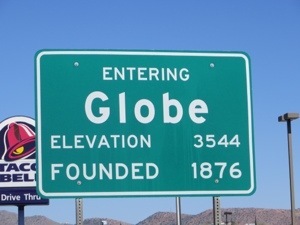 I made it to Globe! Guide Carol warned us last night about the climbs and the lack of shoulders on our route today. I was determined to forge ahead. 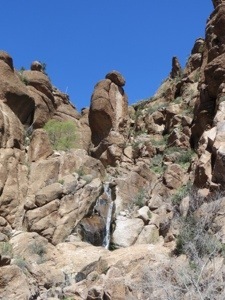 It was a WONDERFUL day, though the uphills were challenging. As another rider said, “I spent a lot of time with Granny” (the lower gears on the bike). 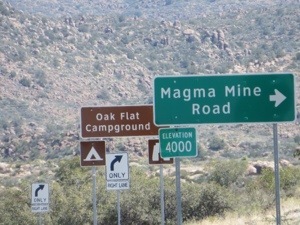 The road was flat leaving Gold Canyon. 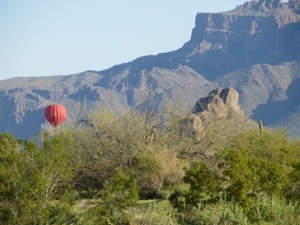 We said goodby to the Superstition Mountains (note the hot air balloon descending), and passed by the Renaissance Fair entry gate (thankfully not yet open, but heard the traffic jam was over 20 miles long later in the day). 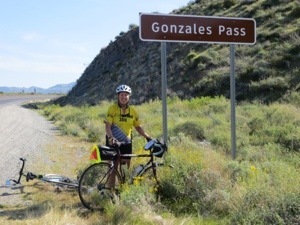 At mile 12, the first uphill began, two miles up to Gonzalez Pass, elevation about 2,100 feet. 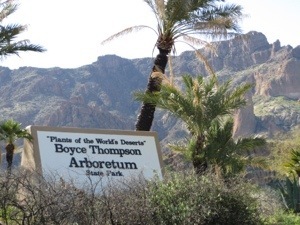 Continuing up, I cycled past the Boyce Thompson State Park Arboretum, knowing I couldn’t explore if I was going to do the day’s mileage. 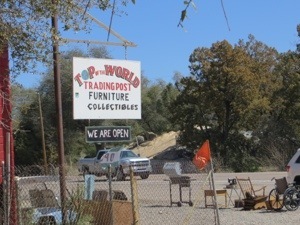 I did stop to use the restroom, and purchased a small guide to the cactuses and flowers of the desert. 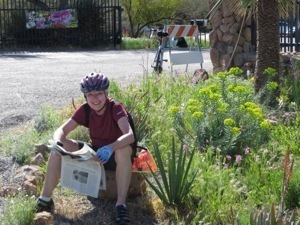 Beth, shown in this picture, was reading yesterday’s news while waiting for cycling buddy Judy. 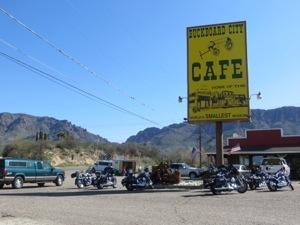 At the Buckboard Restaurant in the town of Superior, it was the moment of decision – those not wanting to continue the climb would secure their bikes and be transported in the van to Globe. I wanted to pedal on. 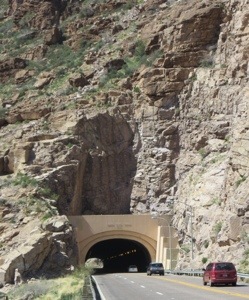 So off I went, after 2 miles encountering the Queen Creek Tunnel. I had 2 flashing lights to be sure the motorists saw me. 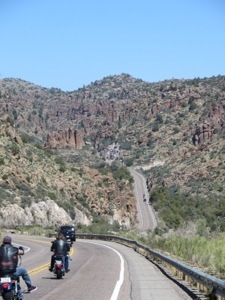 The views were spectacular, though I had to use caution as there was little or no shoulder; in most places there was a passing lane on the uphills, so cars, trucks, and motorhomes could merge left and avoid hitting me (also plenty of motorcycles out for Sunday social rides). After 9 miles of uphill from Superior (notice elevation now 4,000 feet), arrived at Top of the World, to enjoy a nice cold Diet Coke. After a bit more climbing and a screaming 7 mile downhill, I noticed evidence of a copper mine beside the road. The Bluebird Mine is owned by Freeport McMoRan, which acquired companies that had acquired AMAX back in the 90s. 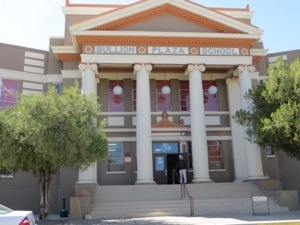 I decided to stop at the Bullion Plaza Museum in Miami (pronounced Mima) to find out more. It was the highlight of my day and of my trip so far! Meet Joe Sanchez, my personal guide to the free museum. He showed me the historic mining artifacts, told me about the ethnic culture of the area, introduced me to Rose Mofford, First Lady Governor of Arizona (1988-1991), and made a contribution to the Leukemia Society. 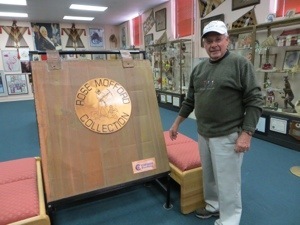 This former postman and mayor of Miami was a delight and so eager to show off his town and the museum. 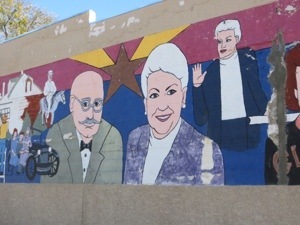 Finally made it to Globe about 3 pm, wandering through the historic downtown, to discover a mural, sadly fading, showing that Rose Mofford was from Globe, as was George W.P. Hunt, Arizona’s first Governor in 1912. Dinner tonight was at Irene’s, a local Mexican restaurant – yummy. Guide Linda had been busy all day transporting riders. My roommate is Jo Lukezic from Florence, CO, a retired Med Tech. She and I rode together coming into Phoenix two hot days ago. Total 51 miles today, GPS showed 3,858 feet of net ascent! Just love your descriptions and pictures. 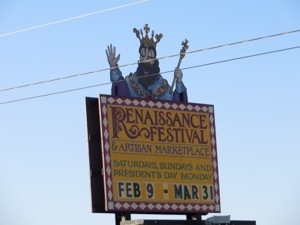 Love the way you stop along the way to absorb the culture. I did trip in 2002 and sure do remember Globe and that tunnel. I admire your initiative to take time at Bullion Plaza Museum in Miami, Dolly, & thankful it was a highlight of your day! Good job on those hills, good for you for not taking the sag! Congratulations on riding all the way to Globe! I continue to be impressed that you have the energy everyday to post all the pictures and commentary. Thank you for the vigorous experience. you are so awesome! Wow you made it with still that inquisitive spirit going strong! I am amazed.